By their very nature, charities are dependent on the goodwill and generosity of individuals who recognise the value of our work, and here at Revitalise we are no exception. You may recall back in July I shared news with you all of the spectacular Abridge Ladies Golf Day event on 30 June, where thanks to a whole host of fabulous fundraising initiatives, the Abridge Golf Club Ladies Section raised an incredible £23,000 – enough to enable us to purchase a brand new, fully accessible minibus for the guests at Jubilee Lodge! 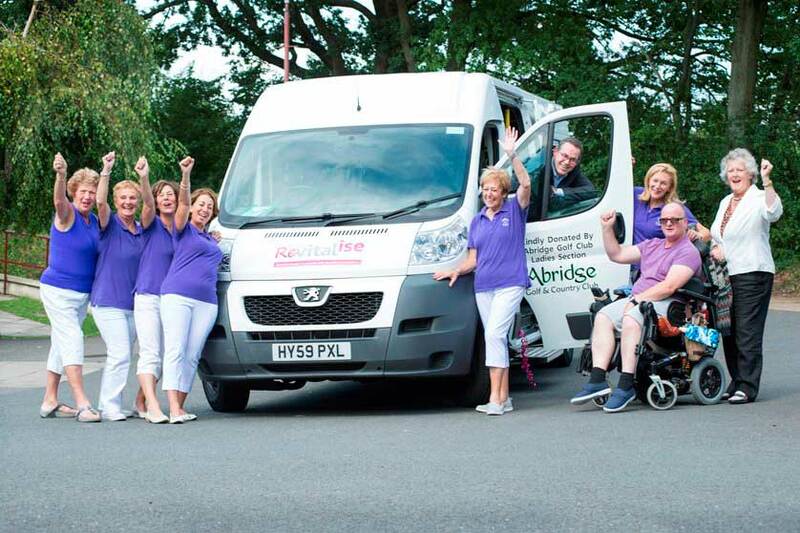 On Friday 21 August, it was time to welcome the Ladies once again – this time to Jubilee Lodge itself – where they officially launched the latest addition to our fleet of accessible minibuses, purchased with their kind donation. Ready and waiting to welcome them upon arrival on that blissfully sunny afternoon was our CEO Chris Simmonds, alongside Trustee Linda Beaney, Jubilee Lodge Centre Manager Jennifer Hamilton-Smith and of course the wonderful guests and volunteers staying at the centre. The Abridge Ladies, namely Lesley Allsuch, Marion Grant, Pam Levine, Alison Levy, Melanie Shlosberg and Ros Valens, gathered together to cut a suitably Revitalise pink ribbon by way of officially declaring the minibus ready for action. What a wonderful afternoon it was! We thoroughly enjoyed being able to welcome our friends and dedicated supporters from the Abridge Golf Club Ladies Section to see for themselves the invaluable contribution they have made in enabling us to take our guests on many more excursions both today and long into the future! “On behalf of everyone at Revitalise I want to thank the lady golfers of Abridge for such an astonishingly generous donation. If, like the Ladies of Abridge Golf Club, you too would like to rally together in support of our charity, there are so many ways you can get involved! However you wish to pledge your support, there are so many opportunities to do so. Click on our Support us page to find out more!